Jack's Opinion: Will Steve Jobs present the new iPad? I have worked on computers since 1982 almost every day. I had my first internet connection in the early ’90s. Since 1994 I am more or less in online marketing. I tweet, I bing, I facebook, I wrote books. But I never ever wrote my own blog. I never thought I needed to, but too many people are telling me I should share my thoughts with others. By the way, you might think my English is weird. You are right; I am originally from Germany. Please excuse any uncommon grammar or unorthodox spelling. Will Steve Jobs present the new iPad? Today is the big day. 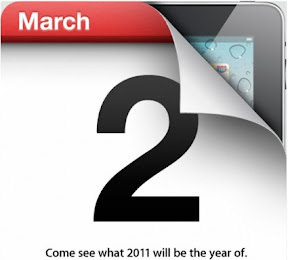 Apple is going to present the iPad 2. But more important and more unclear is, if Steve Jobs will make the presentation. Jobs left Apple a few months ago at an undefined period for medical leave. Shareholders of Apple asking since then to get a statement about Jobs health to understand if he is coming back to run Apple. Jobs was, since his returned to Apple, the driver of the company and influenced the direction of Apple very strong. Jobs not coming back might change the future of Apple and it's stock price. Jobs was seen in the last few months once or twice at the Apple campus and is daily on the phone with Apple executives but he did not run active the company. He attended last week a dinner with Obama. This is all we know. If Apple would be a different company and Steve Jobs somebody else, then he would be at the presentation today to show the world all is fine. Board of Directors would have made him to come to minimize the risk for assumptions and to keep the stock stable. But this is Apple and Steve Jobs. He does not care what other people expect, this made him and Apple what they are today. If he is presenting the iPad, then only because he wants and not because other want to see him. I doubt he will present the iPad, it is not a major product release, it is not magical enough. Groupon - is there a change to come? The freedom of choice. ATT or Verizon. Facebook comments system - good or bad? iPad 2 - how much do we want pay? ipad 2, who should buy? Adobe Wallaby right now more Wanna be. www.new-kid-on-the-blog.com. Simple theme. Theme images by Dizzo. Powered by Blogger.